Shrunken head technique involves removing the bones -- in the case of a head, the skull. The "Sirius/Greer" body appears to include the skeleton, so I don't think it is a shrunken body -- not even the shrunken body of an initially small human. 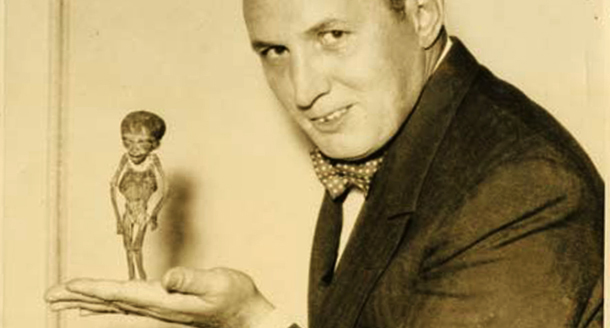 Pick up and flip though Ripley's Search for the Shrunken Heads: and Other Curiosities and you will find the image above of Ripley holding a familiar humanoid. According to his notes, the oddity turned out to be a person who was chosen for a full-body “reduction” rather than just a shrinking of the head. Where did Mr. Ripley find this little guy? 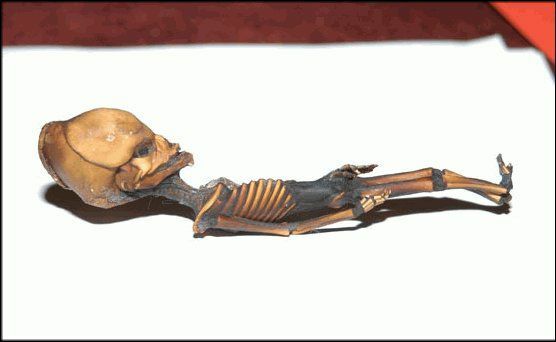 Mr. Ripley found the shrunken body in Peru and named it “Atta-Boy”, after the nearby Atacama Desert, the same desert where Dr. Steven Greer would eventually find the humanoid body in Sirius. Some of us still read books Mr. Greer! Very interesting find although there are still some inconsistencies with such an observation as the humanoid that Greer has sent to Stanford university for DNA sampling has had some obscure results. It matches 91% with our DNA but as you know chimps are 98% alike in their DNA structuring and we can see the vast differences between them and us. Of course Greer is a bit of a sensationalist but when it comes down to the hard science this thing is a mystery to professionals regarded as some of the top in their field. Now whether it is the product of shrinking and the method of such an action that could manipulate the DNA properties of such a human is another venture that could be explored. I suppose I am a bit bias in that I want that little bugger to an alien so that humanity can realize just how small we really are in the cosmos, you know, bring some humility so our egos may stop figuratively strangling each other. The probability of other life out there is 100% if you ask me, the question we should be asking is if there are beings out there that have mastered physics to visit us. Nelson, associate dean of research and operations in Western’s Department of Anthropology, and associate dean in the Faculty of Social Science, has led the Yes investigation, looking to determine whether changes that happen to tissues are part of the pathological process or related to mummification. In other words, is the density of the vertebrae, observed in radiographs of Ramses II, indicative of him having suffered from AS? Or, is the density a result of the mummification process? “We’re looking at the osteobiography of a mummy. We’re trying to tell the story of that person’s life through the analysis of bones and tissues; we want to get as accurate a picture of their life as we can, that we can properly diagnose the disease process and properly differentiate from (the mummification process),” Nelson explained... The goal was to see what changes can be observed in tissues and how long it takes for such changes to occur. Once mummification was complete, researchers examined Yes with MR (magnetic resonance) scans and clinical CT (computerized tomography) imaging, in order to see beneath the wrappings and observe changes to tissues over time. The results of the scans showed a rapid shrinking and a decrease in tissue density, Nelson said, noting the expectation was that tissues would increase in density, not get softer. What this means, Nelson said, is that if we observe increased density in tissue of a mummy, researchers can be confident that it represents real physiological issues, ones not part of the mummification process. “If we see something that is markedly more dense in a mummy, we can be sure it is pathology,” he said. Interesting article but as no time scale is given for the test it's hard to be able to draw any conclusions , the test subject and Ata would also of undergone different processes as Ata was buried in the desert for an undetermined length of time but we don't know if the test subject was buried at all , it also appears well wrapped but we don't know if or how Ata was wrapped . Has bone growth been used before in determining the age of fetal mummies? Yes! This radiological / CT study of two mummified fetus remains clearly states that ossification in the knees is used as part of the factors in determining age. Through analysis of the reconstructed CT images of mummy 317b, we detected tooth mineralization and multiple ossifying centers around the knee, foot, sternum, and pelvis (Table 2). CT detection of secondary ossification centers around both knees of mummy 317b suggested a gestational age of approximately 38 weeks compared with known values . Secondary ossification around the knees was not visualized on radiographs in a previous study of mummy 317b by Hellier and Connolly , who suggested a gestational age of approximately 30 weeks. More sophisticated radiographic methods of perinatal assessment of bone age with parameters such as detailed mineralization of the teeth, changes in shape in centers of ossification, and the mere presence or absence of a center have been used [11, 12]. With two of these methods, the Stempfle score and the Olsen method, we estimated gestational ages at mummification of mummy 317b of 37.3 and 39 weeks. We calculated the mean gestational age of mummy 317b to be 36.78 (SD 1.91) weeks by considering the results of the different methods we used for age estimation. The process and timetable for ossification: Ossification - Human Timetable Ossification is when the body builds new bone - the knee is one of the "secondary centers" and does not go through the process of ossification until after birth. The specific form of ossification related to the knees and long bones is "endochondral ossification." There are two centers for this, the first being "Primary" growth which begins in embryonic development, and the "secondary" which is where bone growth occurs after birth and at a certain rate of formation that are called "epiphyseal standards." These are the standards used to determine "Ata's" age, by Dr. Ralph Lachman from Stanford. The secondary centres generally appear at the epiphysis. Secondary ossification mostly occurs after birth (except for distal femur and proximal tibia which occurs during foetal development). The epiphyseal arteries and osteogenic cells invade the epiphysis, depositing osteoblasts and osteoclasts which erode the cartilage and build bone. This occurs at both ends of long bones but only one end of digits and ribs. the epiphyseal plate, or growth plate, is above the epiphysis (round end of the bone) so that joint movement can continue smoothly as growth occurs. 1) The first stage of bone growth on the epiphyseal plate is the production of hyaline cartilage which creates a space between the epiphysis and the primary length of the bone. 2) At the area the cartilage attaches to the primary length of the bone, it begins to calcify/ossify into hardened bone. Why go through all of this? To determine for myself that 1) IF Ata was merely a fetus, then he would not have growth at the epiphyseal plates of his knees - the "secondary center" for the growth would be present, but not the actual, measurable bone growth, and 2) forensic anthropologists have used secondary ossification centers to determine the age of high-profie mummified fetal remains, and they did not see secondary growth postmortem, but only the formation of secondary centers where future growth would occur. 3) Atta is still a cool mystery. Granted, I'm NOT an expert, but this is the best I can do right now with a half-day's research! Hey gortex - I just spent WAY too much time researching - I just posted it (above). Let me know what you think.